Each time you write something and send it out into the world and it becomes public, obviously everybody is free to do with it what he pleases, and this is how it should be. I do not have any quarrel with this. You should not try and hold your hand now on whatever may happen to what you have been thinking for yourself. You should rather try to learn from what other people do with it. A highlight of my recent visit to the East Coast was discovering the work of Permanent Wave (PW). PW is a network of feminist artists and activists who “challenge gender norms as they manifest in art, politics and personal lives.” The original PW members of New York began their feminist organizing humbly – in the living rooms of people’s apartments discussing social justice issues in consciousness-raising sessions. Eventually, these meetings morphed into PW sponsored shows featuring feminist artists and musicians, skill-shares, workshops, literary readings, festivals and chapters spanning the country in Philadelphia, Boston, D.C. and the Bay Area. I became inspired and determined to bring the combination of feminist community, arts and activism I witnessed in the PW chapters, back with me to the Midwest where I began plans to start a Minneapolis Permanent Wave chapter with Sophia Leenay and Titi Phan. Though PW Minneapolis is a freshly newborn project as of September, the passion and momentum we have possessed from the onset has blossomed into our first PW Minneapolis project: BANQUET, a radical arts magazine focusing on Minneapolis artists and activists. A lot of the mission for BANQUET was formed after deciding on people to include as content for the first issue and considering what “community” means to us. I have discovered in the past two months that so much of community is collaborative effort. I realized this through my short, two-month experience of working in collaboration with Titi and Sophia on Permanent Wave, where I feel that I have already reaped the professional and emotional benefits of community. This personal understanding made me wonder how much potential there is within communities and amongst communities and specifically in subculture communities. What differences exist between the “institutionally-approved” or “legitimized” Minneapolis Arts Community versus the more underground or DIY arts communities? More broadly, what place do punk artists or feminist artists or graffiti artists or outsider artists have in the larger community? What potential is there for collarboration amongst artists in Minneapolis – both with other artists in their particular subculture or across Minneapolis as a whole? Is Minneapolis inclusive and recognizing of art made in subcultures? What will happen when we attempt to bring these people together in one space? My goal with BANQUET is to attempt to answer these questions. BANQUET specifically focuses on creating community through print – to connect people who would otherwise not collaborate together in one space – even if that “space” is on paper. 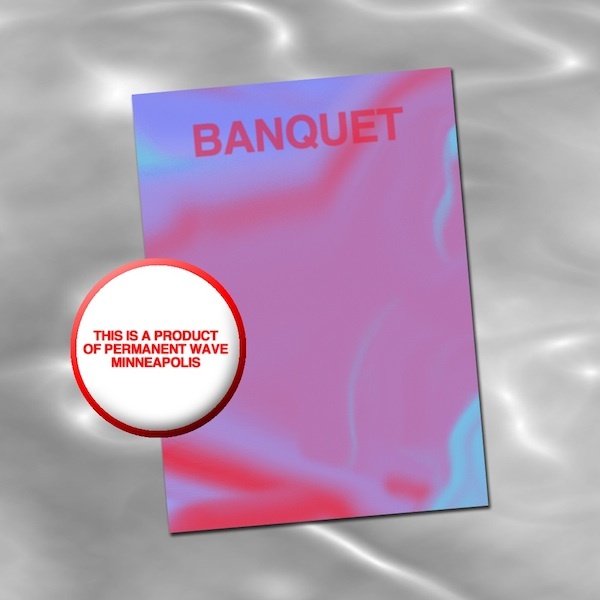 In the spirit of Feminism and its championing of inclusivity and intersectionality, BANQUET is a written and visual dialogue promoting artists through interviews and features with a strong political undercurrent, upholding the benefits of intellectualism yet maintaining accessibility for its audience. Additionally, we consider the importance of archiving and the ability of BANQUET, as printed matter, to be able to describe the state of creativity (specifically underrated creativity) in Minneapolis in 2013. The first issue of BANQUET begins much the same way this essay does – with the inclusion of the Hannah Arendt epitaph, which reinforces the importance of written dialogue and having confidence in the potential of your creations. Also, It was important to me that Sophia, Titi and I have a strong voice as founders, creators and editors. Our voice is present in both the ambiguous cover image as well as the Columns section of the magazine. The cover image consists of three objects – one chosen by each of us – to conceptually describe the content within the pages. The Columns provide more of an explanation for our respective choices as well as an attempt to find “community” in considering these three distinct and separate objects in collaboration – a mirror of what we wish to accomplish in the content of the magazine. The image asks the question: What relationship exists between a knife, glitter, and acrylic nails? Is there potential? The series of interviews and articles follows the introduction of our mission and an establishment of our presence as editors and curators. It is an important challenge to contribute to both the political and artistic aspects of the magazine through the written content. We find a balance between admiration for the subject and genuine curiosity for the projects the are doing, while also maintaining a feminist and socially-engaged dialogue at the root. This is particularly important to me as I feel that it is often avoided in standard magazine interviews at the loss of reaching an audience that might receive it willingly. With BANQUET I hope to make it clear that art and politics have had a strong relationship for centuries and that art has a powerful ability to educate as well as help a viewer understand a perspective outside of their own. In my personal experiences, I did not feel politicized until I studied the Feminist Art of the 1970s in a Modern Art History class. Something about the radicalism and moral and social abandon in the performance art of Carolee Schneemann and installation spaces like WOMANHOUSE greatly expanded my understandings of political issues and how they have the ability to affect the individual as well as the collective just as performance art affects the artist and the audience. With the combination of visual and political dialogue, I wish this same reaction for readers of BANQUET. Nicole Killian, graphic designer and co-founder of the Brooklyn design studio Nylon Dip and visiting professor at Minneapolis College of Art and Design. Claire Avitabile, director of 20% Theater Company, supporting and promoting the work of female and transgender theater artists. As a conclusion to the first issue of BANQUET we have a recommended reading list with an assortment of feminist texts with a wide array of subject matter including music, art, literature, political theory, race, gender, and economics. These titles have been carefully chosen to keep a balance between intellectualism and accessibility. One of Feminism’s biggest setbacks is that it is rarely understood. The list of texts will provide history as well as aspects of feminist theory that are written by some of the feminist theory “elite” but the academic language is certain to never be a barrier to your understanding or interest. BANQUET will be available January 2013.